The changing landscape of healthcare in Pennsylvania impacts all of us, especially seniors and those with disabilities. 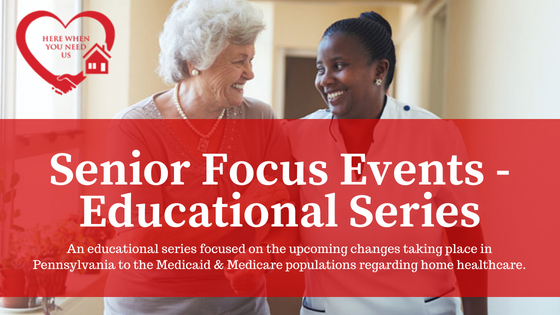 In an ongoing effort to provide timely and relevant information about these changes, Hands From The Heart Home Healthcare Services in partnership with CADA, and other organizations, are sponsoring a series of educational sessions, designed to help inform and educate the community about ways to access needed services. Hands From The Heart has taken an initiative in 2018 to educate and inform our communities on the upcoming transition also known as Community HealthChoices or CHC about to take place in the home healthcare industry. We want to keep our consumers, employees and communities up-to-date on the latest news and information that will affect our consumers in Philadelphia starting in 2019. We are hosting an educational series including several panel discussions throughout the Greater Philadelphia area that will include panelists from CHC and more involved. Each event will feature a unique panel of resources, question and answer time, prizes, free refreshments, raffles and more. All are welcome to attend. Park Tower Apartments on September 13th, 2018 from 11:00 a.m. – 1:00 p.m.
Paschall Senior Housing on September 20th, 2018 from 12:00 – 2:00 p.m.
Mary Fields Presbyterian Apartments on September 26th, 2018 from 11:00 a.m. – 1:00 p.m.
York House on October 3rd, 2018 from 11:00 a.m. – 1:00 p.m.
Wilson Park Apartments on October 15th, 2018 from 1:00 p.m. – 3:00 p.m.
Parkview Senior Housing on November 9th, 2018 from 2:00 – 4:00 p.m.
To find out more information on our upcoming educational series, please contact Kia Poe, Community Relations Specialist, at kpoe@handsfromtheheart.org or by calling (610) 295-5109. HFTH will continue to post relevant articles and up-to-date information on our blog, website and social media accounts for our communities to enjoy and stay informed.